A technique for physically decorating 3D surfaces with user-customized color textures has been generated by a team of researchers from China and the US. The new method is cost-effective and can be used on a range of materials, from plastic to porcelain. A group of researchers from Zheijiang and Columbia Universities have titled their trailblazing method ‘computational hydrographic printing’. According to Kun Zhou, a Cheung Kong professor in the Computer Science Department of Zhejiang, the new method goes with a very low operation cost (less than 40 US cents per printing). While hydrographic printing (the technique used for transferring color inks on a thin film to the surface of a manufactured 3D object) enables high-quality coloring of object surfaces, it's notorious for the inability to precisely register color texture to complex patterns. According to the researchers, it's “uncontrollable” in the sense that the surface location where the color ink is transferred to is totally unpredictable. As a result, these limitations render it impossible to generate certain 3D surface textures. Computational hydrographic printing, in contrast, not only boasts the versatility of traditional hydrographic printing, but also enables point-by-point detailed alignment of surface textures to complex 3D surfaces. The researchers have created what they hail as "the first computational model for simulating hydrographic printing process." 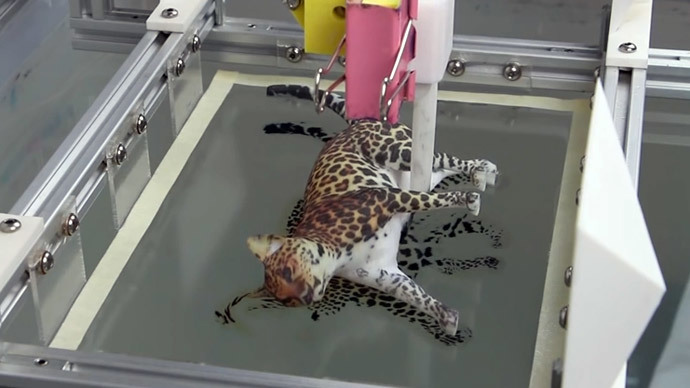 As demonstrated on the demo video, the key step of the hydrographic printing method is the computation of a pixel image to print on a PVA (a water-soluble synthetic polymer) film. After it's transferred to the object’s surface, the colors form a desired texture. The researchers attach the object on a mechanical gripper and dip it into the water. The team uses a Microsoft Kinect that maps the location of the object before immersion; the object orientation and dipping location are both measured by the 3D vision system. The primary objective of the simulation step, according to the researchers, is to establish a map that plots points on the color film to points on the object’s surface. Later, they use the inverse of this map to determine the color patterns that need to be printed on a color film. When dealing with complex surfaces, the team has extended their method to enable multiple immersions, each with a different object orientation, of course, in order the combined colors of individual immersions could form a desired texture on the object surface. The researchers say their method has several limitations, however. If an object is highly concave and has "significant self-occlusions," it becomes difficult to cover its entire surface with color films, even when using multiple immersions. Another drawback of the technique is that the color film distortion during the hydrographic printing affects the appearance of the color. So the more stretched a film becomes, the lighter the color appears when transferred to the surface.